THE two biggest fights at UFC 196 may have seemed like forgone conclusions for most punters, but the underdogs had other things in mind. The women’s bantamweight title changed hands for the second time in its existence while Conor McGregor’s reign at the top of the UFC tree came to an end after Nate Diaz choked out the notorious one. With the UFC’s two most dominant combatants now defeated, betting markets have been turned on their head. Let’s take a look at what happened at UFC 196 and the potential scenarios coming out of the card. Misha Tate caused a massive upset with her fifth round submission win over the Bantamweight champion Holly Holm. The bout was Holm’s first title defence since her shock second round knockout victory over the then-undefeated Ronda Rousey at Melbourne’s Etihad Stadium. Holm looked to have control of Tate, but a last ditch effort from the challenger to submit the champion paid dividends. The fight was always going to be a danger for Holm given the UFC’s ultimate drawcard was a direct Rousey re-match, but with ‘Rowdy’ unavailable until the end of the year, Holm decided to defend her title against Tate. UFC President Dana White mooted the possibility that Ronda Rousey would get the next shot at the Bantamweight champion in a post-match press conference; saying no matter who won at UFC 196, the victor would always face Rousey. “No, I think that Ronda will now fight Miesha Tate for the title – that’s what’s gonna happen … that’s what I said before this fight even happened. Whoever wins tonight will fight Ronda for the title.” White said. The UFC president has been in constant contact with the former champion and believes we will not see Rousey back in the octagon until much later in the year. “Ronda Rousey has worked very hard for three and a half years for this company,” he said. Despite the president all but coming out and saying Tate vs. Rousey III is going ahead, not everyone is a believer. In the eyes of the bookmakers, the more likely scenario is Holm vs. Rousey II with the winner earning the right to face Miesha Tate for the title. Tate said she has no idea who her next opponent will be. “All I want to do next is have some beer and a cupcake. I’ll talk to my management team and then we’ll see what happens. I’m here to fight the best.” Tate said. 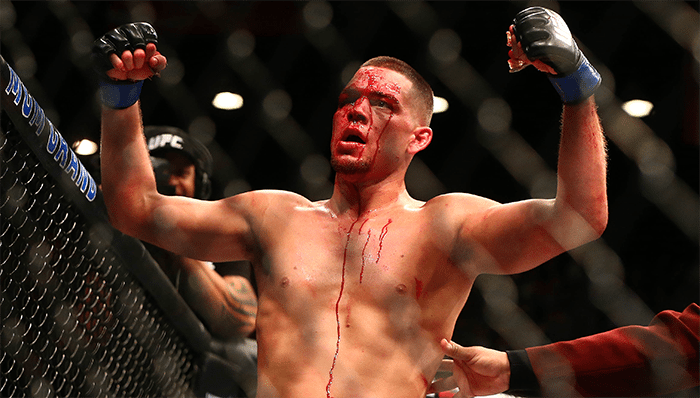 Nate Diaz shocked the UFC with a second round submission of the previously undefeated Conor McGregor. Diaz, who took the fight on less than two weeks notice after Rafael dos Anjos withdrew with a foot injury, was able to finish off McGregor in the dying stages of the second round. McGregor – who had never previously lost as a UFC competitor – dominated the match but was unable to land the killer blow on the more seasoned Diaz. Diaz bided his time and eventually capitalised on a mistake from the featherweight champion and pounced, forcing the Irishman to submit with less than a minute to go in the second round. McGregor said the loss was a ‘bitter pill’ to take, and will look to go back down in weights to defend his title. “It is heartbreaking” McGregor said. The man that McGregor defeated in 13 seconds to claim the featherweight title has already put his hand up to be the man next in line for the notorious one. After Diaz choked out McGregor Aldo posted a tirade attacking the Irishman on social media. “Your fairytale is over. You got nowhere to run,” wrote Aldo in a tweet. The more likely fight for McGregor though is Frankie Edgar. Edgar has torn through the featherweight division on his way to becoming the next in line for a title shot, with his last victory a terrific win over fellow title contender Chad Mendez.